Navratra is the season of fasting and sattvik food. It may sound the death knell for serious foodies but there are places that come to the rescue- like some say “Fasting is only a change of diet”. While health freaks like me may go into an overdrive of how vrat ka khana is still healthy and basically offers some great gluten free options, as long as one eats in moderation. 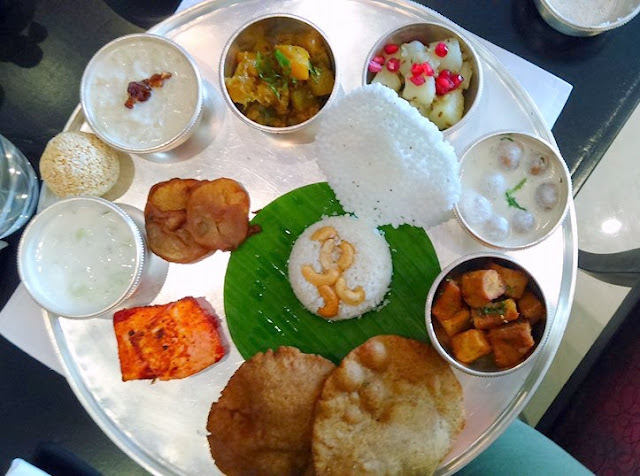 I however was in the mood for some feasting on the 1st day of navratra and decided to check out this amazing offering at the Radisson Blu Plaza, Mahipalpur which is so close to the millennium city. This offering is at the NYC- which is a great place close to the lobby amid some amazing ambience with great natural light- and is only available at lunch. They offer both a-la-carte and thali option but gluttunous me decided to go for the thali. To accompany my sattvik food was some freshly squeezed watermelon juice. The food arrived in a silver thali which gave a very festive and traditional vibe. An array of dishes all stacked neatly in bowls it was a feast for the eyes. Besides it was the typical Indian, starter, mains, dessert all served at once as a part of this offering. The thali included kuttu ki pakori which were so crispy. There was Anari tawa paneer for those who love this high protein vegetarian option. Kuttu ki pooris went very well with kaddu ki sabzi which was spicy and tangy. For those who prefer less oily substitute there was sama ke chawal. Now although the sama was non oily it went very well with delicious ghiye ke kofte which were cooked in a rich creamy cashewnut gravy (to hell with those calories, I’ll detox tomorrow-I thought). We also had some aloo the ubiquitous item on every fasting meal. The piece de resistance however was the shakarkandi ki chaat or sweet potato. They had a lovely chewy texture and were coated with a fingerlicking spice paste. Dessert was Lauki ki kheer with dates and this was the end of a really indulgent afternoon. So book your table today to savour this fantabulous meal since it only lasts for 7 more days.